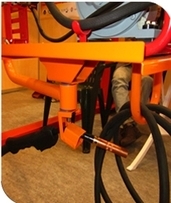 The workers move and carry the welding machine, cables, and gas hoses frequently, which require time and labor, as well as the risks in moving the welding machine up to elevated work platforms. 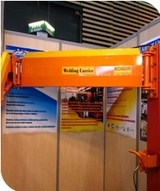 Welding Carrier has eliminated all these problems with their unlimited movement - up/down, right/left, front/back. Workshop will become cleaner and tidier with well-arranged cables and hoses on Welding Carrier, and much safer from electrical accident. ​replacing the damaged cables and hoses ( it affects the production cost). When the work is completed, Welding Carrier can be folded and simply arranged on the wall, So simple! ​please purchase the recommended oil and please fill the pump with a hole on the pump. The load concentrated on the installed spot between the welding carrier and pillars can be distributed, improving producing durability. Manual hydraulic system without electric power requires no operating and maintenance costs.